Table Lamps, Chandeliers and Lots More Lighting! We've got classic table lamps, contemporary table lamps, glass table lamps, wooden table lamps including painted wooden table lamps, stone table lamps, metal table lamps including brass, nickel, chrome, pewter, copper and other types of metal, antler table lamps, office table lamps and study table lamps. The image above shows a selection from our huge range and we mean huge range of lighting. As well as table lamps we also have a range of desk lamps, wall lights, ceiling lights and our favourite classic and contemporary chandeliers including antler chandeliers - the very latest in must have chandeliers and more traditional style chandeliers. We also have a range of contemporary floor lights including tripod lights, extending lights, standard lights and more for your loft apartment, country house, period or modern home. We have recently supplied lighting to the Royal Opera House in London and a Netflix series filming at Elstree studios, so if it's film or theatre / stage lights and furniture you know who to call! See below for details of what's in each section. FREE 7-14 days delivery to UK mainland addresses on all table lamp and other light orders at Harvest Moon. The classic table lamps range includes lots of different lamps for all rooms. The first ones can be found here including Greek urn table lamps, glass table lamps, clear stem table lamps, classsical Georgian table lamps, buffet table lamps, fringed and tassel table lamps and boudoir table lamps. As the classic table lamps range is large we have split it in 2. FREE delivery! Click on the image or the link above to view the classic table lamps range. The other classic table lamps can be found here including glass teardrop table lamp, library lamps and Edwardian table lamps, lots of ceramic table lamps, classic weathered oak table lamps, silver slim stem table lamps, plus brass, nickel plated and bronze table lamps with tartan shades, a stag study lamp, a leather table lamp, glass table lamps and more! Click on the image or the link above to view the classic table lamps range. The first 70 contemporary table lamps can be found here including contemporary wooden table lamps, pebble table lamps, nickel, pewter and chrome table lamps, patterned table lamps, a crackle glaze lamp, glass table lamps, ceramic table lamps and an outlandish twin horn table lamp! As the range is large we have split it in 3 for you see below. FREE delivery! Click on the image or link above to view our contemporary table lamps range. Here you'll find more from the contemporary table lamps range including more glass table lamps, weathered and natural oak table lamps, blue wash, grey wash and white wash table lamps, contemporary metal table lamps and more! Click on the image or the link above to view the contemporary table lamps range. 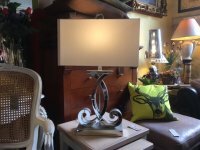 Yet more contemporary table lamps all available to buy at Harvest Moon to light up your home, hotel or office. Here you'll find fabulous horn table lamps, with shade, wooden, ceramic, nickel, silver, gold, copper and glass table lamps and more for you to choose from. Lots of different styles of contemporary ceiling lights for you to choose from including a variety of different metal ceiling lights, industrial style spotlights,a glass pendant light and over table lights. Also a metal bottle rack and wooden slats ceiling lights. Click on the image or the link above to view our contemporary ceiling lighting. More contemporary ceiling lights for you including a copper bowl pendant ceiling light, a contemporary 8 arm ceiling light, contemporary round Accent 3 light ceiling light, a 5 drop ceiling light, downtown electric ceiling lights and lots more. There is bound to be a ceiling light or 2 here to add that finishing touch to your exciting latest kitchen or other home improvement project. A select range of simply divine classic and contemporary chandeliers to add that final flourish to your room. Range includes clear, smoked and black glass chandeliers, crystal style chandeliers, wooden chandeliers, metal, multi armed and tiered chandeliers, a retro starbust chandeliercarved style, Parisienne and Milan chandeliers. As the range is large we have split it in 2 for you so click here for more chandeliers. FREE delivery! Click on the image or the link above to view our chandeliers. Here you'll find more from our chandeliers range including birdcage chandeliers, a retro starburst chandelier, a black beading chandelier, a large gold metal chandelier, a white high gloss chandelier, crystal sphere, small glass dropper and crystal style tier chandeliers iron / rope and bronze sphere chandeliers. The range also includes and dark rustic metal round chandeliers plus traditional clear and smoked glass / gold and wooden droplet chandeliers and more. 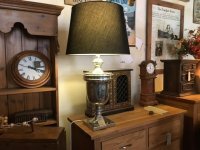 A select range of contemporary metal desk lamps and library lamps including adjustable desk lamps plus simply stunning classic Stag study lamps, a bookcase light, , classic nickel angled library lamps and lots more. Click on the image or the link above to view the desk lamps range for all your study / office desk lighting requirements. A select range of contemporary metal, wood and gloss painted floor standing lights including extended floor standing lights, tripod and spotlight floor standing lights, slim / standard floor lights, adjustable and more floor standing lights! As the range is large we have split it in 2. FREE delivery! Click the image or link above to view the floor lamps range. More contemporary metal, wood, gloss painted and metal / leather floor standing lights including tripod floor light, spotlight floor lights, adjustable floor standing lights (anglepoise style) along with some classic design floor standing lights. Click on the image or the link above to view the floor standing lamps range. A select range of classic and contemporary wall lights for interior use only. The range includes classic plaque wall lights, classic adjustable wall lights, a bronze picture wall lamp and other classic styles. We also have contemporary chrome, nickel, copper, pewter and silver coloured / effect wall lamps, spot wall lamps and outdoor wall lamps. FREE delivery! Click on the image or link above to view the wall lamps range.